Many microcontroller projects involve the use of sensors like Accelerometers, Gyroscopes, Temperature, Compass, Barometric, Current, Proximity and others. 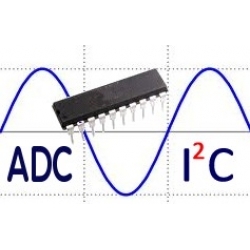 Some sensors have I2C or SPI interfaces but there are still a great many which produce an analogue output voltage. These are measured with the use of the built-in Analogue to Digital Converters (ADC) included in microcontrollers. However, if you are using many sensors and don’t have enough ADC inputs, or have used those pins for other functions, you either have to upgrade to a larger microcontroller with more inputs or resort to using an external (and expensive) ADC chip. With this in mind we have programmed our own microcontroller to provide you with 10 additional ADC inputs available via I2C as a slave device. 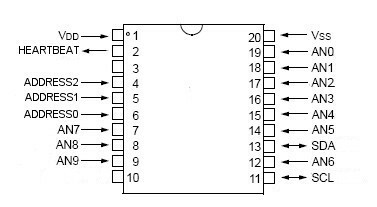 For Arduino example code, check out the datasheet linked to above. Here is an example reading the ADC chip using Python on a Raspberry Pi. It reads the 10 ADC channels at 8-bit (10 bytes returned), then at 10-bit (20 bytes returned), and prints the results.